Sometimes it can be really hard to improve on nature's designs. From the awesome strength of spiderwebs to the improbable stickiness of a gecko's feet, scientists have long been inspired by nature's feats of engineering. And now, scientists from Georgia Tech are looking to snakes to help them design an energy efficient robot that can be used for search-and-rescue missions. On search-and-rescue missions, a robot would have to do a lot of navigating on rough terrain. Most robots can certainly do so, but not without using up an awful lot of energy and potentially overheating. And that's where snakes come in. A snake's scales aren't there just to activate your ophidiophobia; they actually play an important role in controlling the amount of friction that is generated when a snake moves. Of course, by reducing the amount of friction, a snake can expend less energy. In a movement known as rectilinear locomotion, a snake will lift the scales on its belly and then use a wave of muscle contractions that pass from head to tail to move itself forward. The scientists at Georgia Tech videotaped 20 different snakes and studied this rectilinear locomotion, and then attempted to replicate it in their robot, Scalybot 2. 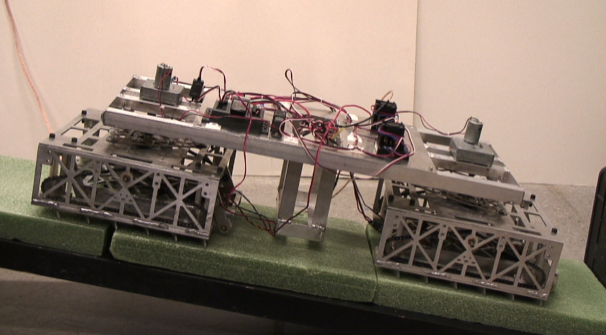 This robot has scales similar to that of a snake, and the angle of the scales are automatically adjusted to accommodate the type of terrain the robot encounters. Ultimately, this allows the robot to expend less energy while moving around.